Emerging evidence suggests the utility of histone deacetylase inhibitors (HDACi) in the treatment of chronic immune and inflammatory disorders such as rheumatoid arthritis (RA). Several studies have shown the decreasing effect of selective HDAC6 inhibitors on the secretion of pro-inflammatory cyto- kines in vitro and a significant therapeutic response has been demonstrated in animal inflammatory disease models. Here we present with Marbostat new small molecule inhibitors of HDAC6 that, in contrast to the esta- blished HDAC6 inhibitor Tubastatin A, are both more potent and specific, and most importantly they highly and selectively inhibit the enzyme activity of HDAC6 without destroying the protein. Figure: Representative DMMB staining of affected joints in a collagen induced arthritis (CIA) model. Dark purple color indicates presence of sulfated glycosaminoglycans in articular cartilage. Vehicle treated animals display signs of synovial inflammation and cellular invasion (arrow heads) and degradation/erosion of cartilage/bone tissue in the joint (arrows). 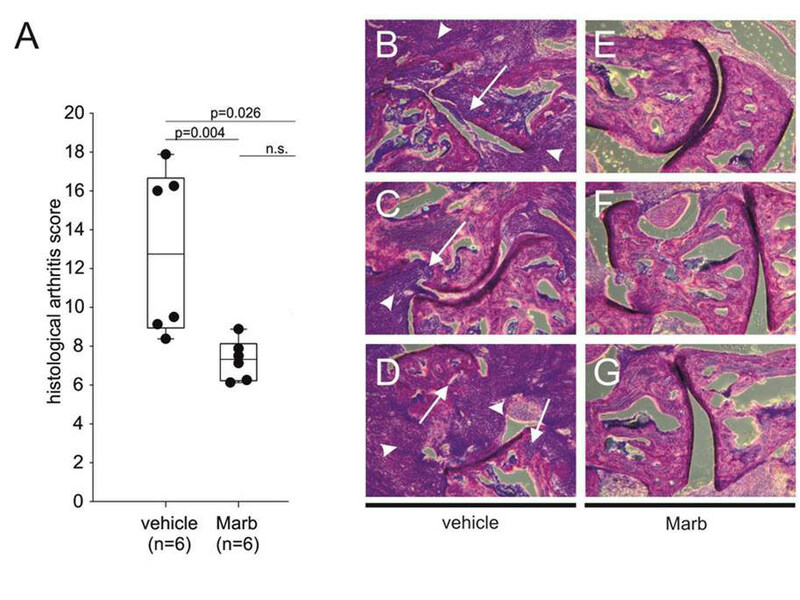 Marbostat 100 (Marb)-treated animals display weaker signs of inflammation, invasion and degradation/erosion.